Remember Ebola, SARS and the movie Outbreak? The artists use tech & textiles to video and sculpture in our exhibition Public Notice to probe the media panic that follows such health scares. Today any outbreaks are non-stop news, students will explore how fear can trump empathy and understanding and think critically about information they consume and create. 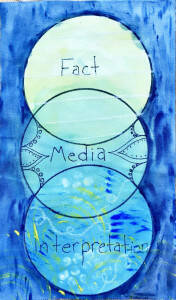 Students will distinguish fact from opinion, recognising how media can sometimes be used to give fear the last word. In the studio: use ink, painting, fabric & textile techniques to create an individualised banner representing growing media distortion, and how our views can become fabricated by media frenzies around events.